Simple Human has a line of kitchen trash cans, some starting at $100 and up. Target offers their house brand trash cans with similar descriptions costing half the price at around $50. The trash cans are both constructed with stainless steel, but don't have any fancy sensors that control opening and closing of the lid. My previous trash can broke unexpectedly, when the foot pedal designed to operate the trash can lid failed. The main reason for the failure of my old trash can is one of the components connecting the pedal to the lid was made of plastic, which eventually gave way and broke! My original trash can was also stainless steel, but circular. My biggest complaint with my old trash can would rip small gashes as I was removing the bag full of trash. It was just poorly designed. I ended up purchasing the Simple Human Rectangular trash can that was 38 liters from Bed Bath and Beyond for $120 before tax (and coupons). Knowing how my previous trash can broke, I inspected all interior hinges that linked the pedal to the lid and confirmed they were all made of metal. Note that not all Simple Human trash cans have metal internal hinges (some still have some plastic components), so if is important to verify in person at a store. All interior hinges to the Simple Human trash can are metal. Unlike my previous trash can which contained plastic pieces which inevitably broke. There is an interior plastic trash bin inside the Simple Human trash can remove all the trash at once. This prevents trash bags from ripping while being removed from the trash can. No more wiping up trash spills on hard surfaces or stains on carpet. On that interior plastic trash bin, there is a small hole in the back to stuff in excess trash bag around the rim. This hole effectively 'tightens' the bag. It acts like a elastic band that is tight enough to prevent the trash bag from falling into the trash can. At the same time, the trash bag is also hidden from view from the outside of the Simple Human trash can. The bottom of the Simple Human trash can is rubberized to prevent the trash can from slipping when the pedal is in use. The bottom of my previous trash can was just plastic, and the can would slide around. The trash can lid has a slow close feature. No more trash cans that "slam" close when the foot pedal is released. Although I have not used it yet, there is a small plastic piece that can be pushed into place to force the garbage can lid to stay open, in case you need it. I often find its easier to just open it, but other may have a good use for this feature. All in all, these three reasons made a huge difference in taking out the trash. Though I've only had the Simple Human trash can around a six months, I expect this trash can to last much longer than my previous trash can and would recommend a Simple Human trash can for anybody looking for a new kitchen trash can. Simple Human has thought through and fixed many problems that exist in other trash cans. 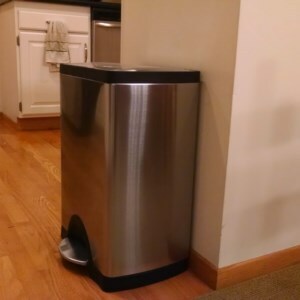 When it comes to trash cans, Simple Human has come up with the perfect can.